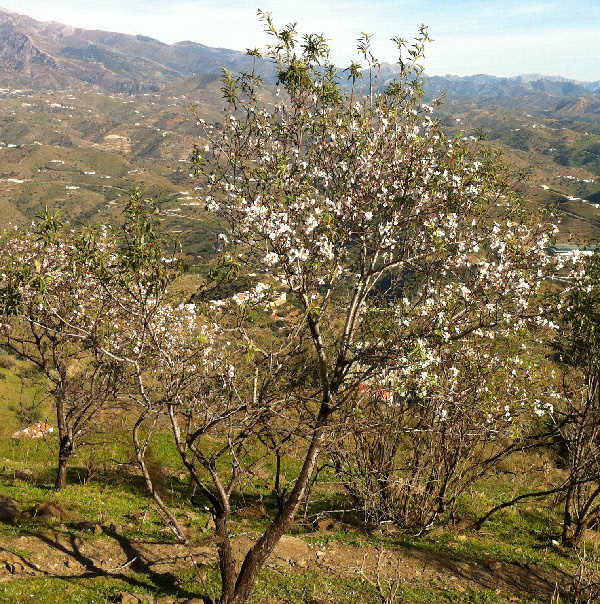 Almond blossom on December 30 in Spain. Yeah, pretty picture, too bad about all the starvation to follow because the co-evolved pollinators don’t get the memo that they’re supposed to work on a fast-changing calendar and fail to pollinate all the fruits. As Lardbutt Limbaugh says, if they’re too stupid to evolve they can just go extinct then. Cue the Kahn-man to explain how this is all going to be just another wonderful opportunity for the all-powerful wise and wonderful Invisible Hand to work another miracle. Because there’s a buttload of money to be made when billions of people will pay absolutely anything for a little something to eat. These are small-scale plantings, not the huge Californian orchards that require trucked-in honeybees. I didn’t see any hives nearby. Cistercian monks were great bee-keepers, I don’t know about Buddhist ones. It’s possible my tree is pollinated by bumblebees, which are still active at current temperatures here. The risk you point to looks serious though. I’d like to see a proper study. The Amazonian rainforest is home to some extraordinarily complex pollination dependencies, which could collapse. Indeed, I am a jerk, that’s true, but I took the caption to mean that the tree was blooming early because of climate disruption. And since a lot of my clients are economically on the very margin, hunger is very present for me. Don’t even get me started on agrofuels (“biofuels” in pr-speak) — I start to froth at the mouth while ranting about the immorality. No apology needed and your comment was a fair one. I did raise the climate change issue. I think perhaps a pretty picture and a pleasant greeting can be a nice way to start the new year, irrespective of long-term policy concerns. And James, I hope the new year is a happy one for you, too. Thanks. Everybody needs a change from the wretched fiscal cliff pseudo-crisis. Washington is getting like Third Republic French politics. Tweedledum government falls! New government formed by Tweedledee! – with the same cast of characters.